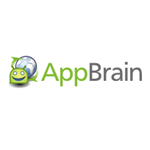 Cloud to device uninstalls are by far the big winner there - AppBrain already allowed some pretty awesome remote control over your phone's apps via your PC, and remote uninstall is a major addition to the existing feature set. Set wallpaper could also be handy - I'm personally not a big fan of how Android handles setting picture wallpapers - but I have yet to test it. Hell, any minor upgrade is an upgrade nonetheless, right? Hit up the QR code or source link below to download or for more information.